Quitzin is our only fully green peony: a niche for the ultimate peony fan. The color of Quitzin her flower buds slowly transforms from grass green to a yellow/cream color. This is a full peony. Tens of thousands of petals fill up the flower: the result is a spectacular, superb bomb. No surprise that this flower is one of our most special peonies. Quitzin is a must-have for plant collectors because of her unique color. Unfortunately, that is the reason why this peony is hardly available for growers. 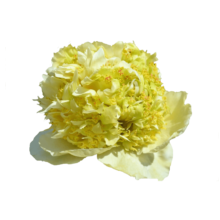 Luckily, we sell this peony because we want to offer such a special peony at all costs. This flower will not be fit for cut flower breeding anytime soon. However, as a niche this product deserves a stage. My Peony Society wants to offer that: that is why you can find the flower in here.